to help mums with babies and toddlers to understand what’s really going on in their children’s heads without interpretation or guessing games so they can feel more confident and relaxed about their parenting. Before I tell you a bit more about how I got here, let me assure you that it’s simple, does not take much time and above all is lot’s of fun. It’s also a journey full of emotional treasures and you decide how far and where you want to go with your baby. I am a mama of two wonderful children and lack of sleep and crying for no obvious reason have made me feel helpless and totally overwhelmed many times. When my daughter (who is 4 months as I’m writing this) cries, I also catch myself shouting at my son because my tolerance level seems to shrivel to zero when she cries and I can’t figure out why. I am a marketing communications specialist by education and had worked in several marketing communications positions in various companies for over 10 years when my son was born in 2008. My communication skills did not get me very far with connecting with my baby. So many times I wished that he could tell me what made him cry, so I could make him feel better and feel safe quickly. I also wished that he could share what was going on in his head so I could feel more connected; feel more part how he experienced the world. Not only did I feel my communication skills being challenged, in my new role as a mum I also felt the strong desire to find a more meaningful path professionally. Something that would allow me to make a difference while still having the time and flexibility to be the mum I wanted to be. That’s when I found out about baby signing. Already as a teenager I was fascinated with sign language but never had a reason to learn it. 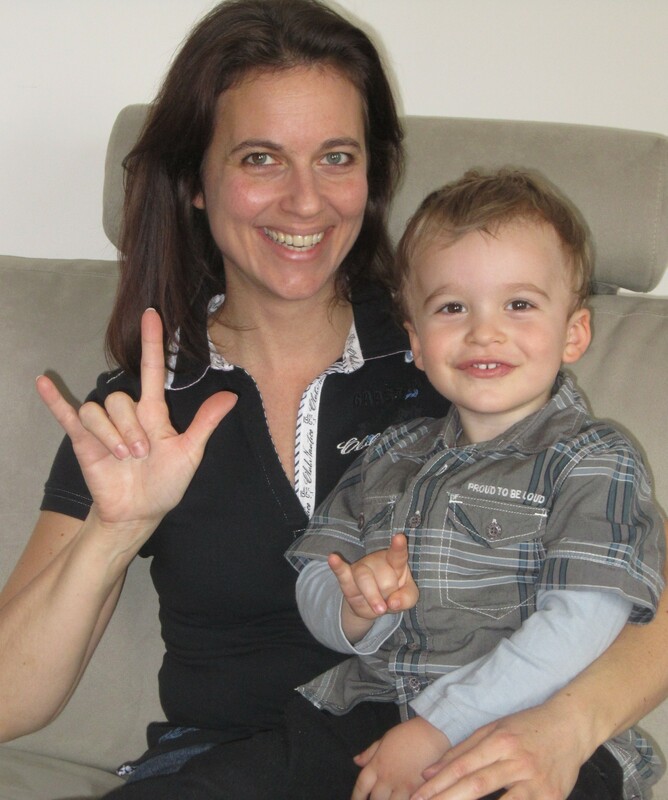 Now I had found a wonderful reason: it would help me understand my son! Despite my husband’s initial scepticism, there was no stopping me in giving it a try. We started when Tristan was eight months old and at only nine months he started asking for his milk without crying. What an emotional moment, it almost made me cry with joy: this was the proof that it’s working. This first experience also converted my husband into a believer. Signs for ‘eat’, ‘more’, ‘all done’ and ‘down’ followed quickly all of which helped make meal time a very pleasant experience for both of us. Once Tristan had realised that he was able to express his wants and needs, he soon added signs that allowed him to simply share his thoughts, these were signs for ‘dog’, ‘bird’, ‘airplane’, ‘flower’, ‘bee’, ‘chicken’, ‘ball’, ‘book’, etc. I could tell you dozens of heart melting stories, stories I would not be able to tell had Tristan not been able to communicate through signing. By the time he was just over 12 months, Tristan had developed a vocabulary of 32 signs and 6 spoken words. I stopped counting before he turned 18 months as his sign vocabulary had exceeded 100 and his spoken vocabulary followed suit with about 70 words (a mix of German and Dutch). The average vocabulary of a two year old is 50 words. From the age of two years, Tristan spoke his two primary languages in full sentences, and he soon developed quite an impressive English vocabulary as well.